e-Biller is Multi-layer Customer Hierarchy Billing and capable of billing from a residential consumer to big corporate client under one roof. It allows operator to assign up to 999 (Nine Hundred and Ninety Nine) Accounts under same customer. e-Biller generates separate invoices for each account under each customer. e-Biller operator can generate over the web, any customer consolidated summary invoice of his accounts, for a particular month. Account & Sub-Account Level Billing is extension of previous level of hierarchy which e-Biller supports. In this competitive market, retention of corporate clients is key factor for any Telecom operators. Often corporate clients want to purchase the services in such manner which suites its own organization settings. e-Biller has ample number of facility for the operator to choose and configure their customer’s hierarchy. Operator can setup up to 999 (Nine Hundred and Ninety Nine) Primary Accounts under any customer named as First Layer. Operator can further assign up to 999 (Nine Hundred and Ninety Nine) Sub-Accounts under any customer individual account named as Second Layer. AND Operator can go up to 999 (Nine Hundred and Ninety Nine) Layer below the chain of customer hierarchy and provide a complete 999*999 Matrix for individual customer. e-Biller provides facility to generate separate invoices for each primary account under its First Layer of individual customer. In this all the Sub-Account charges are billed below the layer are on Primary layer. e-Biller also provides the facility to generate separate invoices for each Sub-Account under its Second Layer. AND e-Biller also allow operator to choose its Sub-Account Level of Billing and can go below the layer chain to produce individual invoices of that layer. Such as in the above Diagram – 3 operators can setup and generate invoices at LEVEL THREE OR BELOW THE CHAIN of the customer. e-Biller provide facility to operator to reflect the customer's organization within the customer master, to assist in providing analyzed consolidated information for the customer's use (provide a total picture of a customer's organization, to assist sales and marketing to the customer). Any customer consolidated summary of his entire accounts and Sub-accounts for a particular month. Any Primary Account consolidated summary of his entire Sub-accounts down the level for a particular month. Any Sub-Account consolidated summary of his entire child Sub-accounts down the level for a particular month. Customer has never ending requirements and us as service provider has to satisfy them with our utmost capabilities for each of their requirements. Marketing executives always tries to sell their new services to each and every department of the customer organization and they need facility to add those services in such a manner that it don't upset the customer organization hierarchy depiction and don't create extra overheads. e-Biller has come up with solution to cope these problems and has provided an extended arm (as Application) to the operator which can be assigned under any level of Account - Sub-Account Hierarchy. 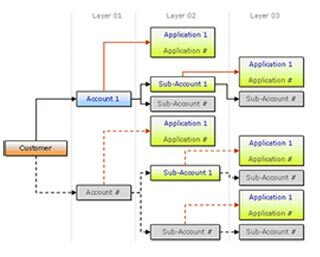 In addition to e-Biller Multi-layer Customer Hierarchy Billing as depicted above, operator are allowed to add multiple applications under any level of Account & Sub-Accounts. These are augmented with pre-defined Billing Plans where various combinations of setup been provided for Usage Rating, MRC, Discounts and Charges. Billing Application under own parent – Here e-Biller generates invoices with Application billed as extended arm of Account & Sub-Account. Generate Separate Invoices for Application – Here e-Biller generates individual invoices for each application. This gives e-Biller users facilities to bill customers division separately. e-Biller properly merges the Application billed items to its immediate hierarchy and provide correct consolidated summary. In e-Biller all the above mentioned combination of summaries for customer/Account/ Sub-Accounts at any level holds true and applications information gets merged properly.